Stedelijk Museum Amsterdam: Museumnacht 2017 "Keith Haring"
For the Museum Night 2017 Stedelijk Museum Amsterdam invited Mick La Rock to be part of the event program. The night's theme at the Stedelijk is -of course- Keith Haring: a celebration to the newly restored Velum that is on display now at the museum and a tribute to Keith Haring and the New York art and party scene of the early 80's. - STUDIO KEITH HARING: make art with Mick La Rock & Roxanne Dekker and watch Job Reuten paint the entree windows. - CLUB 57: Dance like it's 1982 at the auditorium & CLUBTALKS HOSTED BY THE NEW ORIGINALS about the NY artscene of the 80's at the Zadelhoff cafe. 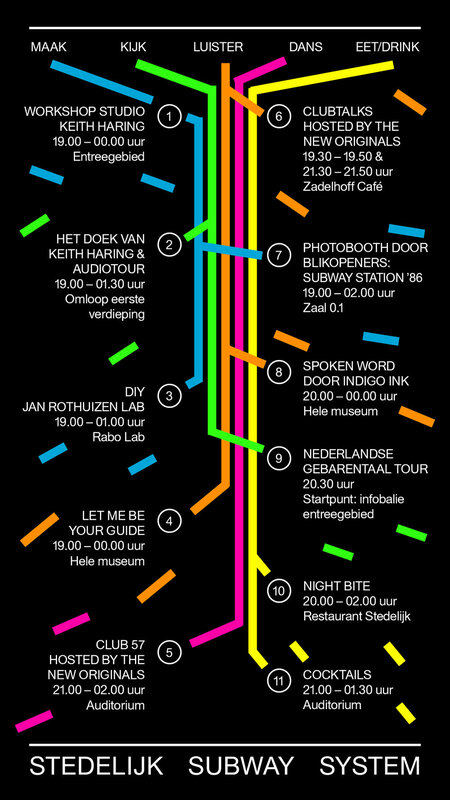 - LET ME BE YOUR GUIDE: The Blikopeners (young curators) will surprise you. - JAN ROTHUIZEN LAB: draw like you're Jan Rothuizen, Keith Haring's former assistant from Amsterdam and now famous artist. Location: Family lab. 19:00-01:00h. - SUBWAY STATION '86. Blikopeners' photobooth. Go back in the days and get yourself on picture like you're Madonna, Haring or Basquiat. - NIGHT BITE & COCKTAILS. At the Stedelijk Restaurant.